Join your friends at One Heartland to celebrate Pride Night at Target Field as we cheer on the Minnesota Twins! 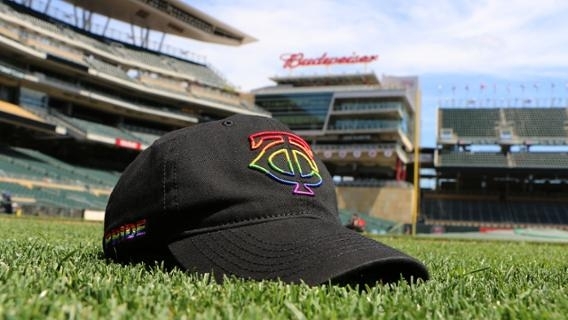 The Twins are offering a special ticket package that includes an exclusive Minnesota Twins Pride Night hat plus your reserved seat to cheer on the Twins vs the Royals on Monday, July 9 at 7:10 p.m. A portion of sales will go to support One Heartland and our Camp True Colors program for LGBTQ+ young people, our fastest growing program! Purchase your tickets here: Pride Night Tickets. Please note: you must buy your ticket through this specific link to access the special ticket package. One Heartland will be hosting a pre-game gathering at a TBD location at Target Field starting at 5pm. More details to come. To RSVP for the pre-game gathering, please email Stefanie at stefanietc@oneheartland.org. We look forward to seeing you for a great night of baseball and celebrating diversity!